My wife has HTC One S with the same PenTile display. I CAN see pixels I look unconfortably close. It is a pain for eyes to look that close. My wife don't know what PenTile is, she can't see pixels and is very happy with the phone. Yes, I would prefer HD display on RAZR i just because it is 2012, not because qHD PenTile is a problem. Would love to have an Intel droid, something new and different. But this phone has the same old long outdated display. Why can't they use a decent HD LCD, instead of that low res pentile that even Samsung users dislike now. High end price but low res pentile, what a combo. AnonD-69316, 10 Oct 2012I compared photo samples from Razr M and Razr i, and I don't understand why there is such huge... more100% agree with every word!!! I had preordered this one phone Amazon, but "fortunately" they delayed the delivery multiple times. As I saw the audio quality measurements in this review, I immediately cancelled my order. They're unbelieveably bad. They seem like outliers. If these measurements hold for all units, my ears would scream in pain. GSMarena: can you confirm the audio quality measurements with another unit? I really would have wanted to get this one, since the only reasonably-sized phone (outside Razr M, that is, which is not available in Europe) that isn't completely low-end. I don't want a brick in my pocket, but I also want some decent hardware! No FM Radio, why am I not surprised? Another crippled total BS offering from Moto. 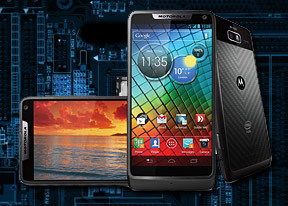 @ GSMArena: Can you do the re-test with another razr i device? I believe many people would appreciate that! Thanks. GSMarena can you test another unit? RAZR M is a great phone with good audio and moderate camera according to GSMarena. RAZR i has bad audio and bad camera. IMHO phones are almost identical, something is wrong. I really like the size of RAZR i and I can live both with PenTile and Intel, but camera and audio? Looks like One S would be a better choice despite its size and the size is very important for me. doggyman, 10 Oct 2012well. given my experience with motorola in defy+ and recent news about atrix (No ICS for prett... moreKey things about Motorola now: New management, from Google, and a cut in number of phone models. JB is promised to arrive shortly. Webtop etc is cut and hence the departments and programming time for that disappears. Google is also changing Android (rumored), so that the customization from manufacturers eventually will not affect the release dates. It will be more like 3rd party launcher from the manufacturers. Won, 10 Oct 2012Is it really that big of an issue about the apps compiler compatibility? I want to try this ou... moreIt can run just about anything. Then Intel chipset support is the same as any other chipset. About 95 % of all apps is the number given by Intel when the first gen's got their Intel earlier this year. Can you confirm the audio quality measurements with another unit? They sounds unbelievable bad, especially when the Razr M had ok measurements. well. given my experience with motorola in defy+ and recent news about atrix (No ICS for pretty much ICS deserving models) I am never gonna buy motorola again. Is it really that big of an issue about the apps compiler compatibility? I want to try this out, and I am wondering how much of the store it can't run. I try to switch to android from IOS becouse i think that phone is stink it cost almost double compared to other smartphones and i switch to Motrorala and buy their products like Atrix 4g and Photon for my family and i after i used it. i totally agreed that android is one of a kind, I ask the sales lady in Motorola if the device will get "ICS" they said it "YES!" i brought it in october 2011, and after a long waiting "SOrry No ICS" It's a dumb marketing strategy, one of the Dishonest company and best of all Problem > sorry > doesn't fix the problem.. I never doubted a company before but this One i Can tell you, "A Thief in disguise"